Deconstructing and disrupting the language of domestic family album: a conversation with Nigel Grimmer on his latest project Art Drag. Nigel Grimmer at Peckham Art Fair. Courtesy of the artist and of photographer Gio Mattia. London-based multimedia artist Nigel Grimmer was one of the shortlisted artists on display at the group exhibition ‘It’s Art Call 2018’, housed within After Nyne Gallery from 31 October to 9 November 2018. The open call exhibition was organised and curated by The Cult House, a cultural platform/collectivity with constantly evolving displays for people to meet and network, founded by J.A. Neto. Grimmer’s body of work revolves around the relationship between the images created for public and private consumption. His enquiry draws on the language of the family album and social media portrait-selfie culture. Grimmer’s practice is focussed on questioning, disrupting, and deconstructing traditional family album images to create alternative frameworks for storytelling. Grimmer works with family and friends (in projects such as Extended Family Album and Analogue Disruption WIP) to create new ‘albums’, aimed at exploring the flatness, and thus artificiality of image-making. To achieve this artistic purpose, he utilised props that ‘either reflected or absorbed light, producing a black or white void within the photographic image’. Art Drag Album. Nigel as Miss Wong. Courtesy of the artist. 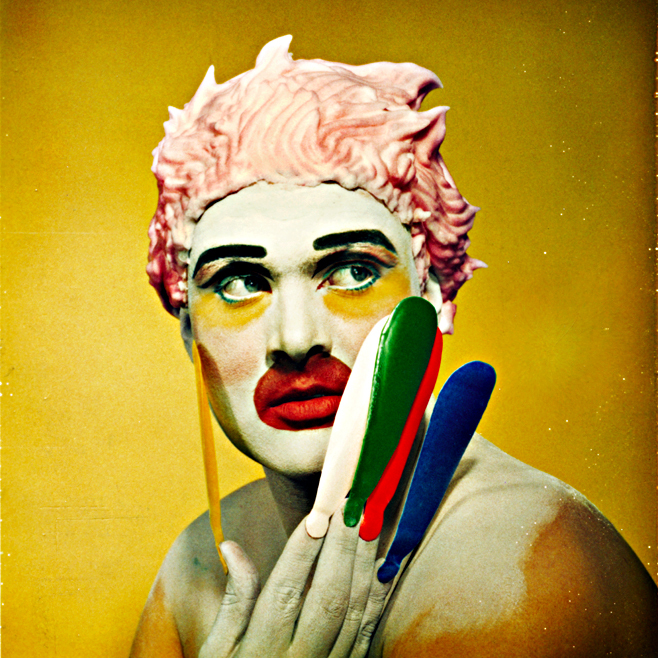 With his latest project, Art Drag, Grimmer disrupts the photographic frame by introducing a secondary picture plane; in this case, a series of vintage prints from the 1960s, that function as ‘windows within the frame causing slippage between the illusionary foreground and background of the photograph’. The portraits serves the additional purpose of reflecting on the history of photography, which was based on a large scale ‘on a male quest for an exotic other’, and these vividly coloured kitsch portraits represent exotic beauties transferred into a more contemporary context by juxtaposing them with sportswear and common clothing. Art Drag Album. Nigel as the Balinese Girl. Courtesy of the artist. Art Drag Album. Nigel as Stephanie. Courtesy of the artist. Art Drag Album. Nigel as Autumn Leaves. Courtesy of the artist. Grimmer is a Senior Lecturer in Visual Arts Practice and Course Leader in Photography & Video Art at University of Bedfordshire. Previous An encounter with London-based Madrid-born actor and performance artist Luis Amália: 2 For a Fiver and Las Rutinas Pervertidas. Next Gran Fury: Read My Lips at Auto Italia. An archive of the seminal AIDS activist art collective.